Just around the capital of Nepal, the sense of real Nepali life can be noticed. This trip provides some great moments to enjoy be that in terms of seeing glorious mountain views, or experiencing cultural and traditional beliefs, or to interact and live a true Nepali life style. Day 01: Arrival in Kathmandu. Welcome and receive from airport and transfer to Hotel. Briefing about the trip. Day 02: Visit the orphanage home whom we are helping. Feel how they have been benefited and will be benefited directly or indirectly from you. Day 03: City tour in Kathmandu. This includes the visits to many historical and architectural monuments such as Pashupatinath Temple, Boudhanath Stupa, Swoyambhunath (Monkey Temple), Kathmandu Durbar Square etc. Drive from Kathmandu to Sundarijal. Trails climbs up through missed forest and pass the village Mulkharka village to Chisopani Danda. In a clear day there are good views of mountain from east to west. 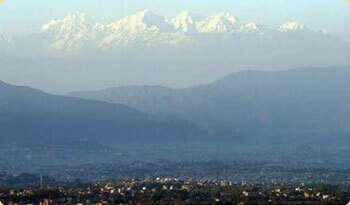 there are good view of mountain and Kathmandu. Valley. An interesting trail takes us to the hill retreat of Nagarkot, perched on a ridge 32 km east of Kathmandu. An easy walk takes us about 2 and half hours to get to Nagar. It commands sweeping views of the Himalayas. Five of the world’s ten highest peaks, Everest, Lhotse, Choyu, Makalu and Manaslu are visible from here. Nagarkot is also a popular spot to watch sunrise and sunset. The trail climbs up to the tower of Nagarkot. From the tower there are excellent views of mountain including view of Mt Everest and Kahmandu valley. Trail descends through rhododendron forest and villages to Dhulikhel. In a clear day there are excellent view of eastern Himalaya. Walk through many different ancient villages and terrace. This is one of the famous places in Nepal for Buddhism. There are some interesting Tibetan Buddhist Monasteries. Beautiful mountain view is also an added attraction of the place. Then continue trek to Panauti. It is a gradual up and down through forest to the ridge from where beautiful mountain views are seen. It is about 4 hours walk to Panauti. It is a beautiful ancient city with many temples. It is inhabited by Newars, Tamang and Bramhans people. Walk through many different ancient villages and terrace. The green forest and the views are really enchanting. Lakure Bhanjyang is another attraction of your trek offering great views of Himalaya, valley and landscape and experience of great trekking in Nepal. It’s approx 3 hours hiking. Overnight at Lakure Bhanjyang. Trekking down to Lubhu for approx. one and half hour and Drive back to Kathmandu. Free day in Kathmandu. Land transportation from Kathmandu to Sundarijal and Lhubhu to Kathmandu by private car/van.